Providing you the best range of diagnostic kit packing machine and tridot packing machine with effective & timely delivery. Since our beginning, we are engaged in presenting a wide range of excellent quality Diagnostic Kit Packing Machine. Our provided range is rigorously tested by the team of our professionals. 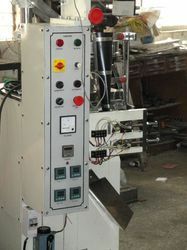 The pouch formation feeding, filling and sealing of the cassette is fully automatic. Mainly used in diagnostic kit manufacuring industries, our clients can avail this machine from us at market leading prices. Unitek has installation of machines with leading companies in India for this application. Since our beginning, we are engaged in presenting a wide range of excellent quality Tridot Packing Machine. Our provided range is rigorously tested by the team of our professionals. The pouch formation feeding, filling and sealing of the Tridot is fully automatic. Mainly used in diagnostic kit manufacuring industries, our clients can avail this machine from us at market leading prices.